What is an ISBN code and what is it used for? This was the question that come to mind whilst rumbling through the books on display at MACBA’s Archive and Library in Barcelona. 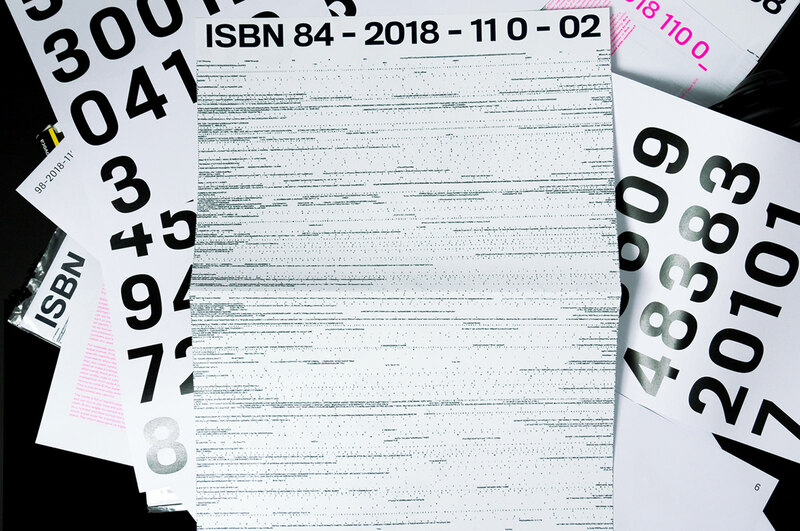 We came across a book named No-ISBN: On Self-publishing by Bernhard Cella, which is an investigation into books that have been self-published without an ISBN. We looked into every single detail of what the International Standard Book Number was. It’s a personal identification number containing metadata in order to catalogue books with ease. Which is highly useful for the distribution of books. 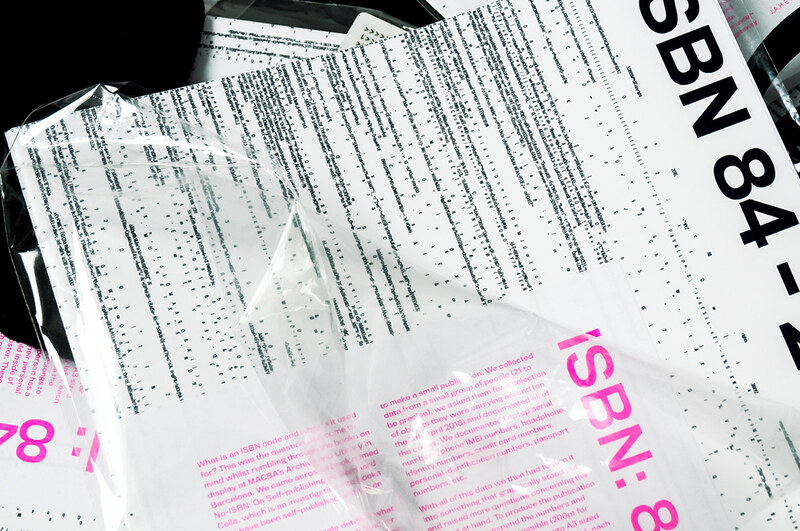 The question: What happens to books without an ISBN? came to mind, and after some research into this we found that most library’s accept them and there really isn’t any issue with books without the codes, they’re are mainly just a little harder to find (although the internet at times can be a magic place where anything can be found) but in general they aren’t any different to books with them. The conclusion is that to publish a book without an ISBN is just cutting costs from an expensive process. Without a clear direction to take this subject we then started to look into other objects/items with identity numbers, we started to notice that almost every product we had in our possession had some sort of code to identify it. Everything has an identity number, from our trousers, to us as human beings. At times I think we are unconscious about how much these little numbers and letters composed as identification are used. For example, purchasing food from a supermarket. First there is the food item’s specific identification code which is then scanned to show the price of said item, then our credit card’s personal number is used to make a transaction of numbers, afterwards there are a whole bunch of other codes used to verify and make the transaction from code A (us humanoid forms) to code B (the supermarket entity). This is just an everyday example of what these codes are used for. 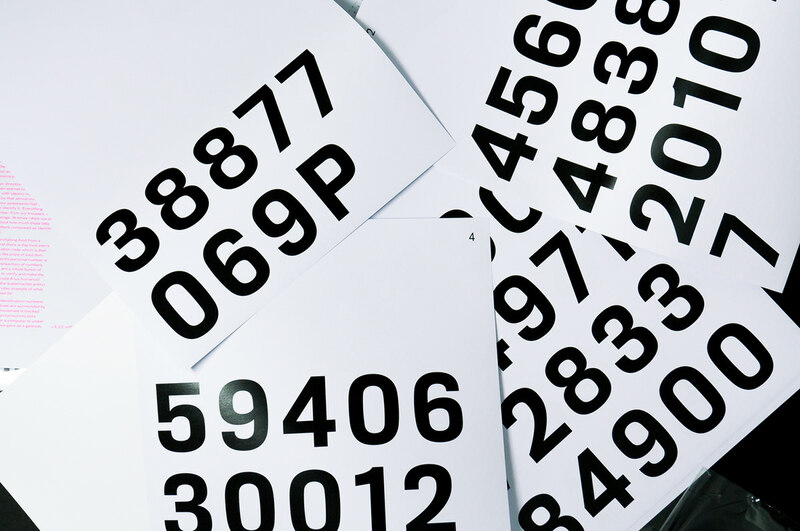 The world is full of identification numbers, and our day to day lives are surrounded by them. Every single movement is tracked by a number and then turned into data which is just code for a computer to understand. This information gave us a gateway to make a small publication. We collected data from a small group of people (21 to be precise), we asked them for a selection of objects they were carrying around (on the 11th April 2018) and documented all of the codes. We documented Laptop serial numbers, phone IMEI numbers, headphone identity numbers, credit card numbers, personal identification numbers, passport numbers, etc. With all of this data we then had to turn it into something that graphically stood out and raised more questions concerning the subject at hand. 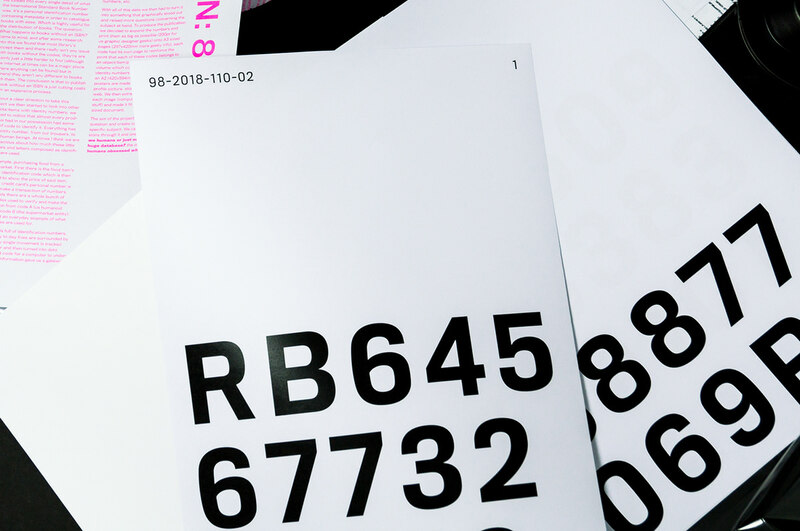 To produce the publication we decided to expand the numbers and print them as big as possible (200pt for us graphic designer geeks) onto A3 sized pages (297x420mm more geeky info), each code had its own page to reinforce the point that each of these codes belongs to an object/item/product. 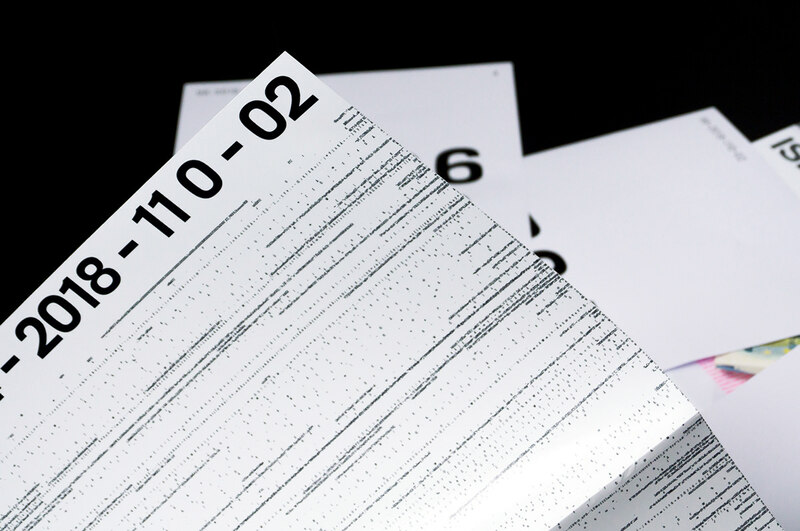 Each person has a volume which collects all of their personal identity numbers and then held inside of an A2 (420x594mm) sized poster. These posters are made from each person’s profile picture, stolen from the world wide web. We then extracted the code from each image (computer geek, hacker, matrix stuff) and made it fit onto the 420x594mm sized document. The aim of the project was to raise a question and create consciousness of a specific subject. We came to a few conclusions through it and one them being: Are we humans or just numbers in one huge database? the other is: Are humans obsessed with numbers? 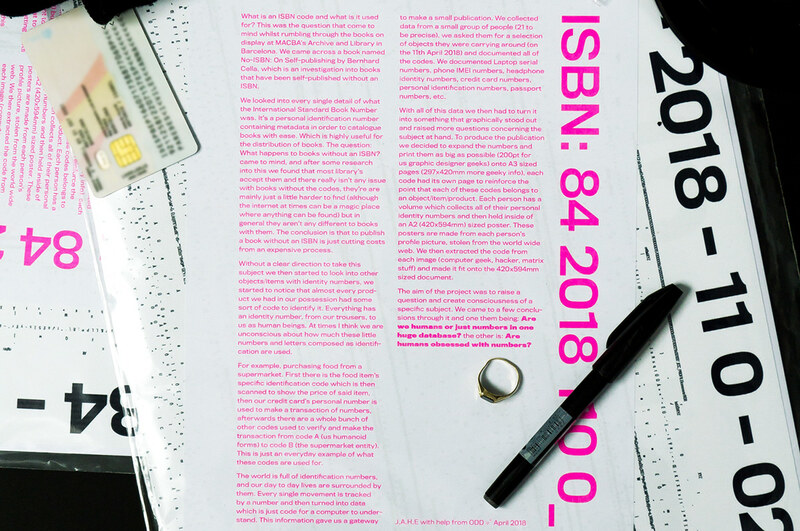 ISBN: 84 2018 110 0_ What is an ISBN code and what is it used for? This was the question that come to mind whilst rumbling through the books on display at MACBA’s Archive and Library in Barcelona. 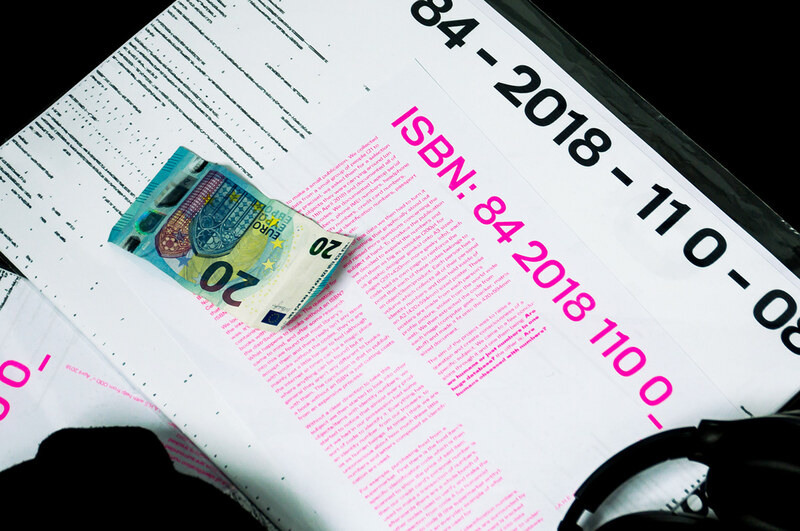 We came across a book named No-ISBN: On Self-publishing by Bernhard Cella, which is an investigation into books that have been self-published without an ISBN. The aim of the project was to raise a question and create consciousness of a specific subject. We came to a few conclusions through it and one them being: Are we humans or just numbers in one huge database? the other is: Are humans obsessed with numbers?